Sam, 21, has been appointed as an engineer at Axiom GB after passing his NVQ Level 3 Mechanical Engineering. He has been with the company for three years, starting as an apprentice. For the last few weeks, Sam has been part of the team installing a new dispatch solution for Lakeland to handle picked and packed orders from its warehouse in Kendal. 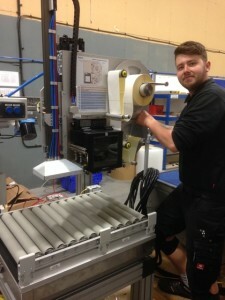 He is pictured here in the process of building a labelling machine.